Steen Ostergaard trained as a carpenter, received a silver medal in 1957 and graduated from the school of arts and crafts of Copenhagen in 1960. The same year he was first prize in the annual competition of the Guild of upholsterers. From 1962 to 1965 he worked in the Finn Juhl design office, where he contributed to the development of several seats in solid wood frame of an exceptional quality. In 1965, he opened his design office and a few years later, he designed his first plastic product - the seat Cado 290 (1968), which was later manufactured by Paul Cadovius around 1970. 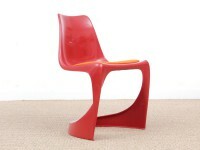 It is one of the first plastic seats made in one piece and of a single material, molded polyamide. The elegant shape is clearly inspired by the stackable chair by Verner Panton (1959-1960), originally made in Baydur (a solid foam Polyurethane) in 1968 and from 1970 Luran-S (thermoplastic polystyrene) molded. However, unlike the Panton draft, the Cado 290 is available with optional cushions that screw directly on the seat frame. The chairs Ostergaard can be assembled to form rows, and twenty-five units can be stacked on a specially designed trolley. There is also an armchair version with high back. Somehow the chair Cado 290 is a more economical than Panton's because the lower recessed portion uses less material. In addition, the shell is thinner thereby decreasing the total weight of the seat. Since Ostergaard drew many other seats, but none managed to match the Cado 290 - functionally and aesthetically exciting design, determined by its manufacturing process, and technology thoroughly exploits recent development of plastic point.